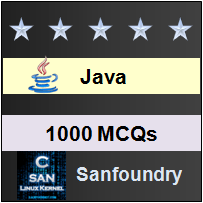 Our 1000+ Java questions and answers focuses on all areas of Java subject covering 100+ topics in Java. These topics are chosen from a collection of most authoritative and best reference books on Java. One should spend 1 hour daily for 2-3 months to learn and assimilate Java comprehensively. This way of systematic learning will prepare anyone easily towards Java interviews, online tests, examinations and certifications. Who should Practice these Java Questions? The section contains questions on integer, character, floating and boolean data types, variables, type casting and conversions and properties of arrays. The section contains questions and answers on arithmetic, bitwise, relational, boolean and assignment operators. The section also contains questions on control statements. The section contains questions and answers on oops concepts, jdk, jre, jit and jvm, polymorphism, encapsulation and java buzzwords. The section contains questions on fundamentals of classes, methods basics, heap and garbage collection, object creation, constructors, access control, string class, method overloading and static keyword, command line arguments and recursion. The section contains questions and answers on the concepts of objects, method overriding, inheritance, abstract class and super. The section contains questions on the character extraction, string handling functions like stringbuffer class and methods, stringjoiner class and other string comparison functions. The section contains questions and answers on various concepts of java.lang like data types, types of classes, character and byte streams, builtin exceptions, rounding functions, system class, byte, short, double and float wrappers, character and boolean wrappers and environment properties. The section contains questions on networking basics, server, sockets and httpd class, serialization, deserialization, url class, networking datagrams, htttpresponse and urlconnection class. The section contains questions and answers on aspects of java.util like maps, array list, hash set, tree set, linked list, stacks, vectors, dictionary and hash table, rmi, iterators, collection framework overview, collection interface and algorithms. The section contains questions on basics of exception handling, exception types like throw, throws and nested try. The section contains questions and answers on basics of multithreading, thread basics, thread creation, isAlive(), join() and thread synchronization basics. The section contains questions on applets fundamentals, static import, basics of I/O, file reading and writing and reading console i/p and writing console o/p. The section contains questions and answers on regular expressions and text formatting. The section conatins questions on basics of event handling, different types of event handling classes like actionevent, componentevent, containerevent, textevent, mouseevent, windowevent and other event listener interfaces. The section contains questions and answers on locale, random number and classes, timer class, formatter, internationalization, i18n with date, number, currency and time. The section contains questions on awt, swing, java i/o and string swing. The section contains questions and answers on packages, core java api packages, interfaces and its types. The section contains questions on junits, java 8 features, hibernate, file and directory, liskovs principle, aggregration, inference, autoboxing and unboxing. The section contains questions and answers on generics and its methods, wildcards, restrictions and reflecting generics. The section contains questions on java beans, jdbc and design patterns. The section contains questions and answers on eclipse debugging, web application, servlet, client and server. The section contains questions on session management, jsp and its elements, reflection api, autocloseable, closable and flushable interfaces. The section contains questions and answers on application lifecycle, annotations, reflection, dynamic installation and invocation. The section contains questions on reflection, class<t> class, metadata uses, packages, sockets, http and tcp servers. The section contains questions and answers on database and sql basics, relational databases, rmi client and server implementation, ddl and dml basics, advanced jdbs and sql escape syntax. The section contains questions on row sets, j2ee programming, rowset specialization, struts, map interfaces and classes. The section contains various questions and answers on jsf, ejb and java se security. The section contains questions on opencv for java, currenttimemillis() method and spring framework. If you would like to learn Java Programming thoroughly, you should attempt to work on the complete set of Java questions and answers mentioned above. It will immensely help anyone trying to crack Java Programming or an interview. Here’s the list of Best Reference Books in Java Programming Language. Wish you the best in your endeavor to learn and master Java programming language!